Plastic sheet molding, known as vacuum forming or thermoforming, is a versatile, reliable process for a vast number of applications. From consumer goods to automotive parts, medical components and office equipment, thermoformed plastics are affordable and dependable. But this plastic sheet molding process isn't a one-size-fits-all approach. The materials used, specific services or processes and the skills of the plastic sheet molder come together to create the perfect applications for thermoforming. Need some examples? Here are six applications that are perfect for this plastic sheet molding process. Thermoformed equipment covers offer protection from impact, the elements, ultraviolet (UV) radiation and corrosion to all types of equipment with faster lead time to production than injection molding or rotational molding. Whether it’s a branded, colorful, consumer-facing piece or a functional industrial equipment cover, the plastic sheet molding process of vacuum forming gives the flexibility of design and the durability needed to protect OEM equipment. ABS (acrylonitrile butadiene styrene): Used for its strength, impact resistance, rigidity and heat deflection. HMWPE (high molecular weight polyethylene): Used for its durability and high chemical resistance. ASA (acrylonitrile styrene acrylate): Used for its strength, rigidity, chemical resistance, thermal stability and weather resistance. Thermoformed medical equipment covers enable clean and dry storage of medical instruments and equipment, including IV pumps, ventilators and liquid oxygen system covers. This plastic sheet molding process is a reliable method of producing the high-quality products needed for the medical industry. Acrylic: Used for its transparency and high resistance to impact, chemicals and stains in equipment covers such as dispensers and draft shields. PVC (polyvinyl chloride): Used for its high resistance to chemicals and stains, strength, rigidity and flame retardant qualities. HIPS (high-impact polystyrene): Used for its low cost, impact resistance and dimensional stability. HDPE (high-density polyethylene): Used for its high resistance to chemicals, impact and electrical conduction. 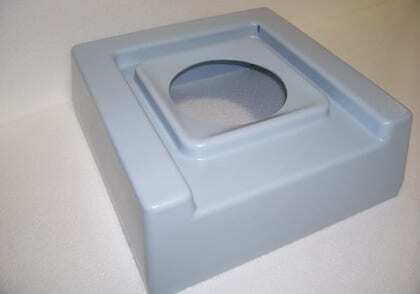 Consumer, business and medical displays all need housings to protect them, and thermoplastic housings do the job right. Typically, these are pressure formed to add logos, sharp corners and detailed designs. PVC Alloys (flame-rated polyvinyl chloride): Used for their high resistance to chemicals and stains, strength, rigidity, and flame retardant qualities. HIPS (high-impact polystyrene): Used for its ease of processing, low cost, impact resistance and dimensional stability. ABS (acrylonitrile butadiene styrene): Used for its strength, impact resistance, thermal stability and heat deflection. The plastic sheet molding process of vacuum forming is also used to create various types of agricultural equipment and components, including panels, roofs, interior components for tractors and farm machinery, sprayer shells, feed/water containers and livestock housings. It often works better than sheet metal components because of the equipment's exposure to UV radiation and elements and plastic resins' resistance to corrosion. TPO (thermoplastic olefin): Used for its strength, rigidity, high resistance to chemicals and dimensional stability. ABS (acrylonitrile butadiene styrene): Used for its strength, impact resistance, customized rigidity and heat deflection. PC (polycarbonate): Used for its extreme resistance to impact, clarity and good insulation. Acrylic: Used for its high resistance to impact, chemicals and stains. Automotive components including panels, doors, seating parts, dashboards, bumpers, air ducts, truck bed liners, floor mats and headlight covers are all ideal applications for thermoformed plastics. Vacuum forming is best for the larger, shorter-run components (such as bumpers and interior panels), while pressure forming brings out precise, sharp details and attractive surfaces when needed (such as parts with logos stamped in). ASA (acrylonitrile styrene acrylate): Used for its strength, rigidity, chemical resistance, thermal stability, weather resistance and high gloss in components such as housings and profiles. ABS (acrylonitrile butadiene styrene) and ABS blends: Used for its strength, impact resistance, customizable rigidity, versatility and heat deflection in components such as dashboards and wheel covers. TPO (thermoplastic olefin): Used for its strength, rigidity, high resistance to chemicals, and dimensional stability in components such as foams used for ducts or liners. PETG (polyethylene terephthalate glycol): Used for its clarity and chemical resistance in components such as electrical connectors and switches. Brightening a room with a skylight can easily be accomplished using plastic sheet molding, in part because it's actually more transparent than glass and shatterproof grades are available. Skylights may be vacuum formed or drape formed, depending on the shape and aesthetic needs of a particular application. PC (polycarbonate): Used for its high resistance to impact, superior fire rating, clarity, weather and UV resistance, and good insulation. Acrylic (PMMA): Used for its transparency, good UV and weather resistance, tensile strength and available shatterproof grades. As you can see, the plastic sheet molding process of thermoforming, or vacuum forming, isn't a one-size-fits-all approach but hopefully, you have a better understanding of six applications that are great for using this process. For further questions, or to see if plastic sheet molding would be the right fit for your needs, contact us to speak to a Joslyn Manufacturing representative.